Enjoy a wonderful hand-made pizza in the beautiful surroundings of Blackhawk Plaza. Dine in, take-out, or delivery. All of our pizzas are hand-spun and made to order. Let us know how you like it: NO SAUCE, EXTRA SAUCE, NO CHEESE, LIGHT CHEESE, HALF BAKED, WELL DONE. "Best New York Thin Crust Pizza I've EVER had!" "This place is DA BOMB! They have been in business for 20 years.. This is easily the best thin crust pizza I’ve had in Northern California. 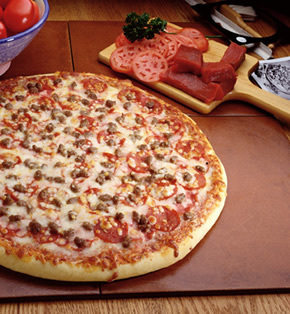 The Sicilian thick crust pizza is great too!. And ask for crushed garlic on the pizza. The calzones are spectacular."